The gas-handling systems of most auto-loading shotguns built today are basically the same as the very first one introduced by Sears, Roebuck in 1956. During firing, a port located about a third of the way down the barrel allows propellant gas to flow against a piston located on the magazine tube. As the piston travels to the rear, it pushes on a steel bar, the opposite end of which is in contact with the bolt. This causes the bolt to travel through its operating cycle of ejecting the spent case and feeding a fresh round from the magazine to the chamber of the barrel. A 12-gauge shotgun is designed to operate on the volume of propellant gas produced by the 2-3/4-inch shell, and since the 3-inch shell produces a greater volume of gas, the gun could suffer damage when it is fired unless the excessive gas is bled off in some way. This is usually handled by a spring-loaded valve that remains closed when a 2-¾-inch shell is fired but opens to vent the excessive gas produced by a 3-inch or 3-½-inch shell. All things considered, it has proved to be an excellent system, but there are moving parts to wear out, it adds weight to the gun and some design variations are difficult to clean. Gas Piston System Those clever guys at Remington have come up with a different way to skin the cat in a new shotgun called VersaMax, and it just might prove to be the best design to come along in over half a century. Gone are all those parts sliding to and fro on the magazine tube, and in their place is pair of gas cylinders attached to the bottom of the barrel at its chamber. Officially called the Versaport Gas Piston System, seven gas ports in the wall of the chamber allow gas to flow directly into the cylinders. And here is where the design gets really interesting. Rather than utilizing a mechanical valve to limit the amount of gas flow to the two pistons, it is handled by the length of the shotshell used. When a 2-3/4-inch shell rests in the chamber, all seven of the ports are positioned forward of its mouth, and this allows all of the gas produced to flow to the pistons. When a 3-inch shell is in the chamber, its case reaches far enough forward to block off three of the ports, thereby reducing the amount of gas flowing to the pistons. With a 3-1/2-inch shell in the chamber, four of the ports are blocked off. As gas enters the two cylinders, their pistons push on both sides of the bolt face with sufficient energy to shove the bolt through its operating cycle. The pistons are free to travel about 3/8-inch before coming to a stop, and as they reach that point, two large ports in the sides of the cylinders are opened. At this point the gas has done its job, so it is exhausted outward through those ports and deflected upward along both sides of the barrel by the walls of the forearm. If the design has a flaw, it is here. 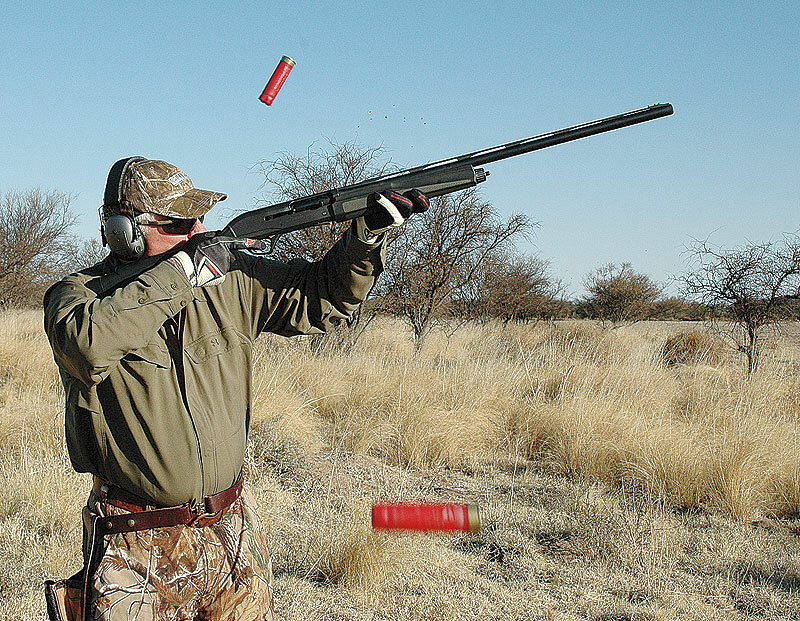 I had an opportunity to try out the VersaMax on doves in Argentina, and while shooting into the wind my face got lightly peppered by a few unburned propellant particles. It happened only twice in four days of shooting, and I was wearing eye protection, so no harm was done--although it did prove to be a nuisance. The Breakdown The VersaMax is easily field-stripped without tools for cleaning. After the magazine cap and forearm are removed, the barrel is free to be pulled from the receiver. A twist of the wrist removes the bolt handle, allowing the bolt to be pulled forward and out of the receiver. Pushing on the firing pin with a finger while turning the bolt on its side and giving it a light tap frees the retention pin of the firing pin for removal. At that point, the firing pin is used for further disassembly of the bolt. It can also be used to push out a retention pin in the side of the receiver for removal of the entire trigger assembly. Taking it apart for cleaning takes mere seconds, and putting everything back together is just as quick and easy. During breech lockup, lugs on the rotating bolt head engage shoulders in the barrel extension. The bolt release button is located at the front of the receiver, and while it works fine, I wish it were a bit larger. A cartridge release lever at the right-hand side of the trigger guard allows quickly switching from, say, a quail load to a pheasant load in the chamber. Southpaws among us will be happy to learn that the transverse safety button just behind the trigger can be reversed just for them. While shooting doves, I wore thin leather gloves and found the trigger guard roomy enough. Magazine capacity is three 2-3/4-inch or 3-inch shells, but capacity is reduced to two when 3-½-inch shells are used. A plug for reducing magazine capacity to two for either shell length is included with the gun. Barrel length options are 26 and 28 inches, both with a ventilated rib that tapers from .555 inch at the receiver to .270 inch at the muzzle. The rib wears a .080-inch silver mid-bead, while a fiber-optic sight up front comes with interchangeable pipes in three colors and two diameters. The bore is lightly overbored at .735 inch and hard-chromed to resist rusting. The TriNyte coating on the exterior of the barrel and the aluminum receiver is the same near-indestructible protection introduced by Remington several years ago on its Model 700 rifle. And since the magazine tube is machined aluminum, it won't rust, either. A walnut stock will come later, but for now it is synthetic in two colors. If you prefer black, you will get four flush-fit ProBore chokes in Improved Cylinder, Light Modified, Modified and Full. If being hidden from sharp eyes is your thing, the camo version comes with four extended chokes designated by Remington as Flooded Timber (.004-inch of constriction), Over Decoys (.009 inch), Pass Shooting (.014 inch) and Turkey/Predator (.060 inch). Length of pull is 14-1/4 inches, but by using one or more of the supplied recoil pad spacers it can be 14-3/4, 15 or 15-1/4 inches. Switching to a thin aftermarket SuperCell pad sold by Remington reduces pull to 14 inches. Recoil force against the shooter's cheek is absorbed by a rubber insert in the comb of the stock, and one of standard height comes on the gun. Medium-height and high inserts are also available and are easily interchanged. While shooting doves, I found that I missed fewer shots with the comb of medium height than with the one that came on the gun. Pitch and castoff of the stock are also easily adjusted for the individual shooter. Some guns come with a package of shims to be used for this purpose, but Remington has a better idea here as well. Removing the rubber comb insert exposes a removable steel plate at about the midpoint of the stock. The stock bolt can pass through one of several holes in the plate, and the one chosen determines the amount of castoff and pitch in the stock. A hex wrench included with the gun fits the stock bolt and the gas cylinder caps of the barrel. The gun weighs eight pounds, and that along with its gas operation makes it quite comfortable to shoot. Test Shots All of this description is well and good, but by now you are probably wondering how well the VersaMax works. I shot it for four days in Argentina, and as rounds fired go, one day there is equivalent to a lifetime for many hunters. I enjoyed splendid pass-shooting on doves and pigeons, and there was also very good shooting on flushing birds such as wood partridge and perdiz. Ammunition made there is deadly on gamebirds, but its powder leaves behind far more residue than most shells loaded in the United States. Even so, the gun I was shooting went just over 2,000 rounds before fouling in its barrel built up to the point where an occasional shell became a bit stubborn about completely entering the chamber. Each time that happened, a push on the bolt handle sent the shell the rest of the way home. After I started thoroughly cleaning the chamber with bore solvent and a brass brush every 80 boxes of shells, it was clear sailing. Upon returning home, I was anxious to see how well the gun would function with a variety of loadings and shell lengths, so I rounded up a supply ranging from light target loads and medium-power field loads in the 2-3/4-inch shell to heavy 3-inch and 3-1/2-inch waterfowl and turkey loads. I made the test even tougher by loading three different shell lengths in the magazine each time--and experienced not a single malfunction. Rather impressive, to say the least!